With the country in raptures over the launch of John Lewis's latest Christmas ad campaign, Marketing tracks the evolution of what has become the biggest advertising event of the year. We look at what has come to define a John Lewis Christmas ad – charting the brand's return to the UK's TV screens in 2007, following a three-year hiatus, to last year's snowman in love. What is apparent from revisiting the work is how John Lewis's ads have developed, while maintaining certain tropes, evolving from the stylised, minimalist approach of 2007 into the poignancy-laden narrative of 2012’s offering. One characteristic common to all the ads is the pithy use of music. But while 2007’s ad was backed by a classical piece, they have since made the use of famous covers their trademark, using tracks by artists as diverse as Guns N’ Roses and The Smiths. 2008 was the first year that Craig Inglis – today John Lewis’s marketing director, then its head of brand communications – became more visibly active in the brand’s advertising. He told Marketing at the time that the ad purposely avoided images of excessive consumerism. The campaign, which relaunched its "Never Knowingly Undersold" customer proposition, still used tableaux to convey its message, although the increased emphasis on narrative hinted at how the retailer’s Christmas campaigns would develop. The campaign helped drive a Christmas period sales increase of 12.7% on the previous year. In February 2010, Inglis’ contribution to John Lewis’s marketing was recognised by his promotion to director of marketing, nearly a year after marketing director Gill Barr left the company as part of management cutbacks. Not long after, "She's always a woman" hit the screens for its spring campaign. Later that year, the retailer unveiled a 60-second Christmas ad comprising several vignettes depicting people wrapping presents for loved ones, with one scene showing parents in the background sneaking a rocking horse up the stairs while their children watched TV. Up-and-coming British singer Ellie Goulding covered Elton John’s 'Your Song' for the ad, which to date has garnered 908,000 hits on John Lewis’s YouTube channel. The strategy paid off, with the ad proving massively successful online – within days of its launch it had passed the one million mark online, while today its total views on YouTube stands at 5.2 million. Love was again the beating heart of John Lewis’s Christmas campaign in 2012, despite the ad’s lead characters being far from warm-blooded. 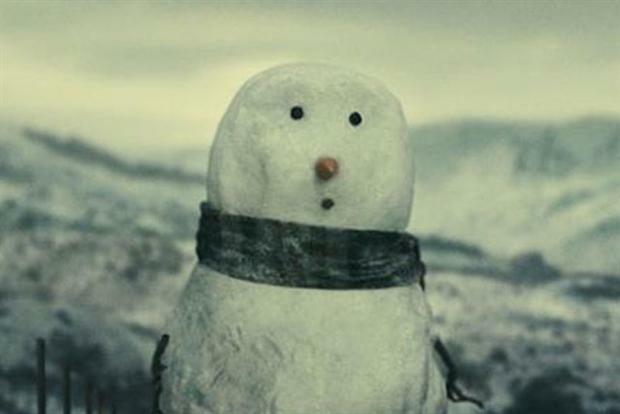 In the 90-second spot by Adam & Eve/DDB, a snowman goes on a quest from the country to a John Lewis store in the city to buy a hat, gloves and scarf for his snowwoman-lover, with the outcome witnessed by a young girl looking out of her bedroom window on Christmas morning. The ad was not as popular online as 2011’s "The long wait"; although it drew a far-from-paltry 3.5 million views on YouTube. Rumours about the creative hadbeen drip-fed to a ravenous public (and media), including that the ad would be accompanied by a cover of Keane’s 'Somewhere Only We Know' by Lily Allen. ITV's viewers gained a sneak preview last night during ITV's 'Agatha Christie's Poirot', when an animated image of a bear was shown with the hashtag #sleepingbear. On Friday morning, the full epic ad was revealed and sent Twitter into meltdown - again.